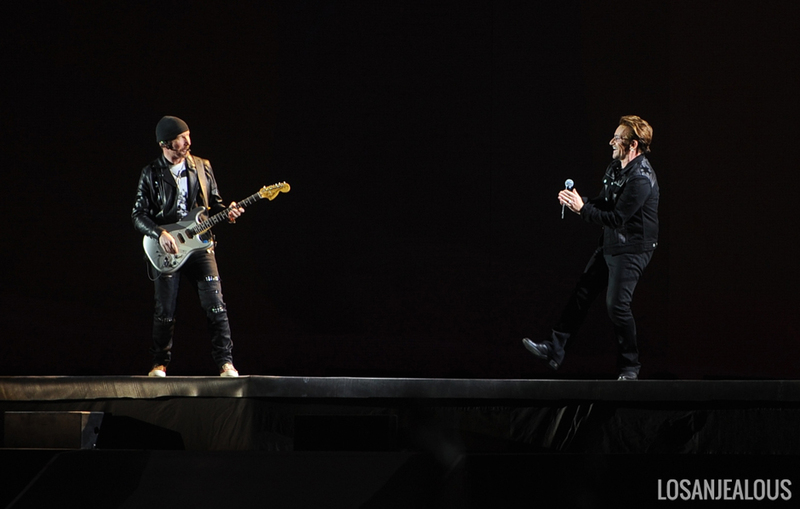 Along U2’s The Joshua Tree 30th anniversary tour, with twenty-one North American dates, including a headlining of Bonnaroo, it figures that the Rose Bowl shows in particular would promise to be special. Besides newer tackily branded barns like Levi’s or AT&T or Papa John’s (ugh…) Stadiums simply lacking the soul of the near-100-year-old local venue, the Rose Bowl is essentially the home venue to the iconic imagery of the album. The desert soul that permeates the album native to the area; the actual Joshua Tree park and Zabriskie Point of the cover shot are about a two hour drive east (some enterprising fan has mapped the spots, including the actual tree from the album art location here). You might say these two shows are a sort of homecoming for the album. Only if you’re U2 in 2017 can an over two-hour show how featuring a 200-foot 8K resolution display seem to be a somewhat scaled-down production. 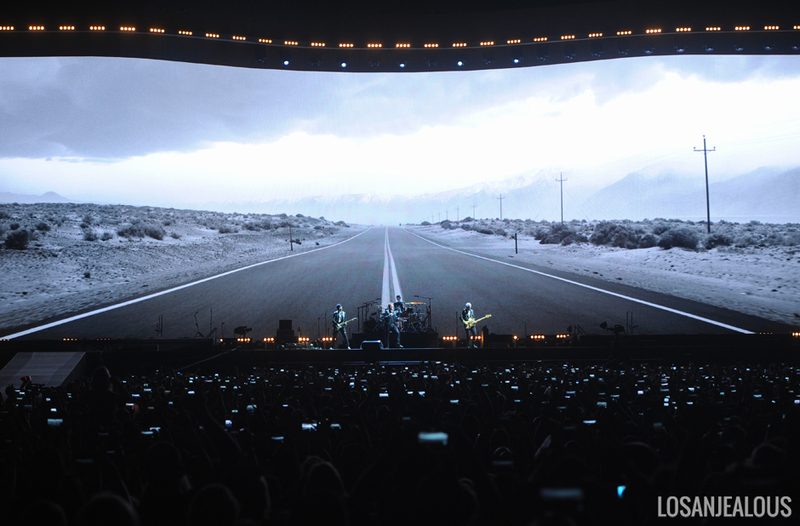 But following the likes of past massive tour productions such as Zoo TV or the 360° tour in-the-round stage or the arena-length stage and screen of the Songs of Innocence tour, the current set up is about as clean and simple a set up as U2 can deliver–the aforementioned screen, complete with that iconic Joshua tree yucca silhouette peaking out of the top frame, anchoring the end-zone stage and their usual smaller secondary stage out in the people shaped as a shadow to the tree. 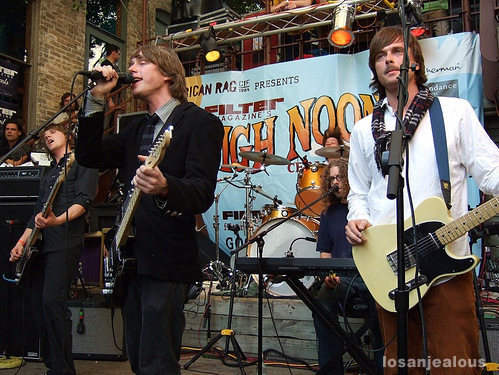 Ending their pre-show tape (a fun blend–the expected Bowie and Clash, some less expected more recent indie cuts–“Summertime Sadness,” “Nikes,” “Kids”) with a cranked-up airing of Soundgarden’s “Black Hole Sun,” in tribute to the recent passing of Chris Cornell, set off cellphone torches and reflective moods in the crowd. Cornell also later received a dedication to “Running to Stand Still,” a slight catch in Bono’s voice as he referred to him as a lion. 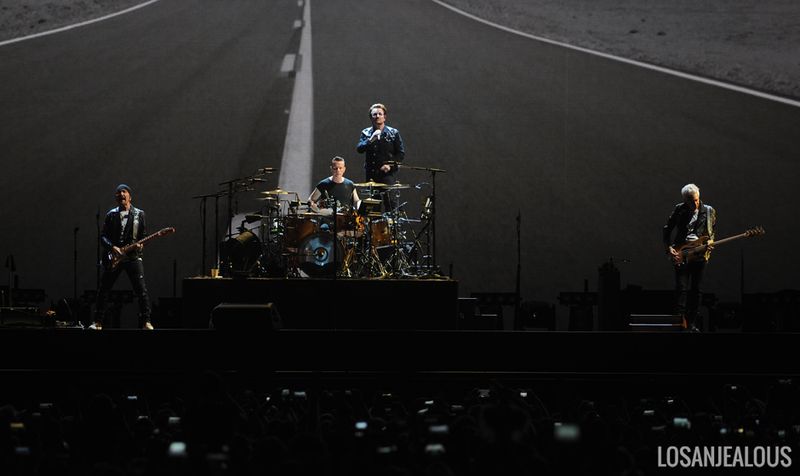 The band, four international icons, long since the most familiar quartet in rock since Led Zeppelin–though Bono insists on introducing Larry Mullen, Jr., Adam Clayton and The Edge every night–are rounding into live performance shape here on the fourth show of the tour, warming up into fighting live show shape after a few years off the tour circuit. Tonight we get a thoroughly satisfying stadium rock show that still leaves one selfishly wanting more. That ageless Mullen, Jr. (all four of them looking rather well preserved) opens the evening with “Sunday Bloody Sunday’s” eternal staggered beat; that that song can be tossed off as the opener gives a sense of the absurd riches of their catalog. The set list of three parts is laid out with a rough chronological flow, a couple from 1983’s War, a couple from 1984’s The Unforgettable Fire, leading into the whole of 1987‘s The Joshua Tree. This tour has them dusting off tracks from the back half of the album not played since the late 80’s, as well as first time ever live takes on “Red Hill Mining Town,” in a new piano arrangement backed by sampled horns. Bono’s harp blowing was on point for “Trip Through Your Wires.” “Exit”, live, sounds a bit like Bauhaus in the best way. 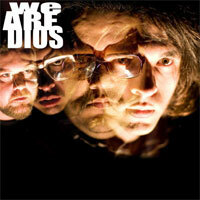 “Mothers of the Disappeared,” the understated album closer and sounds even better now with less of the dated digital effects on the album version. 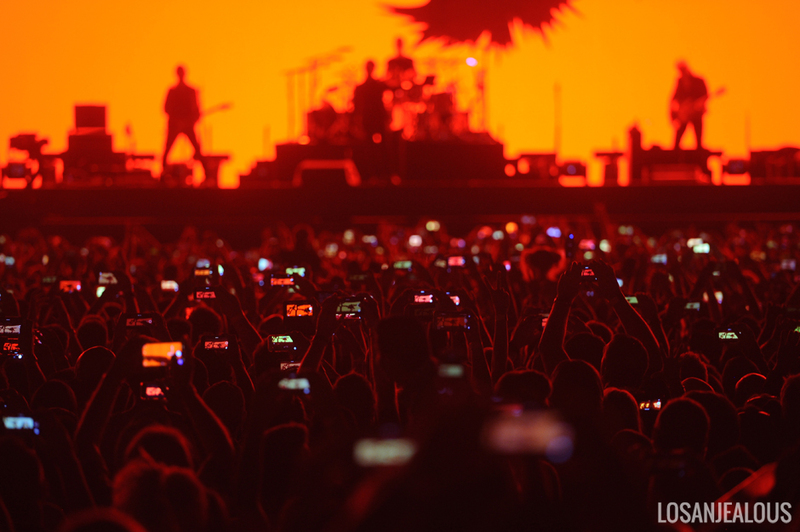 New landscape videos for the tour, again by the Anton Corbijn, accompany The Joshua Tree set. Black and white shots of those iconic yuccas, long desert two-lane blacktop driving tracking shots (accompanying “Where the Streets Have No Name” obviously; though we would not have minded a revisiting of the corner of 7th & Main Downtown, the site of that song’s famous 1987 rooftop video), some color desert rock vistas and Native American imagery sprinkled in. There are also some slightly cheesy shots of a young lady in an U.S flag bikini top that plays with “Trip Through Your Wires.” There is an interlude with video from an obscure 50’s TV show that some have attributed to “predicating” Donald Trump. A bit of comic relief, but a rather weak jab at the cartoon of a president. Songs from the first half of The Joshua Tree, their biggest album, in myriad ways, have long packed U2 tour set lists. “Streets,” “ISHFWILF,” “Bullet the Blue Sky” are all show stoppers on their own when placed in the right point a typical set; run close together live as on the album, they can be overwhelming and seem to wash over one another. 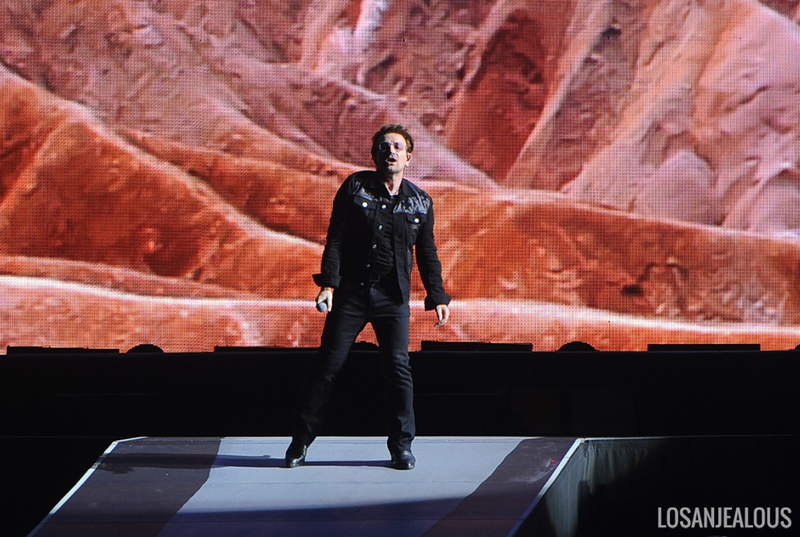 At the end of the Joshua Tree set, Bono says “These desert songs mean a lot to us. 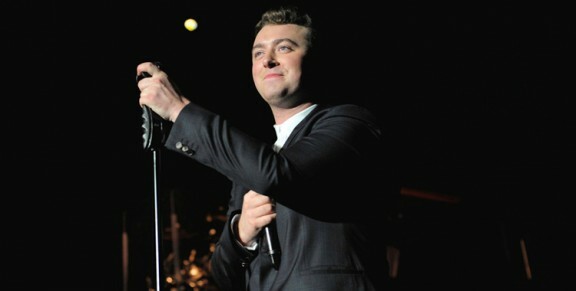 It seems like they mean a lot to you as well,” in the understatement of the night. 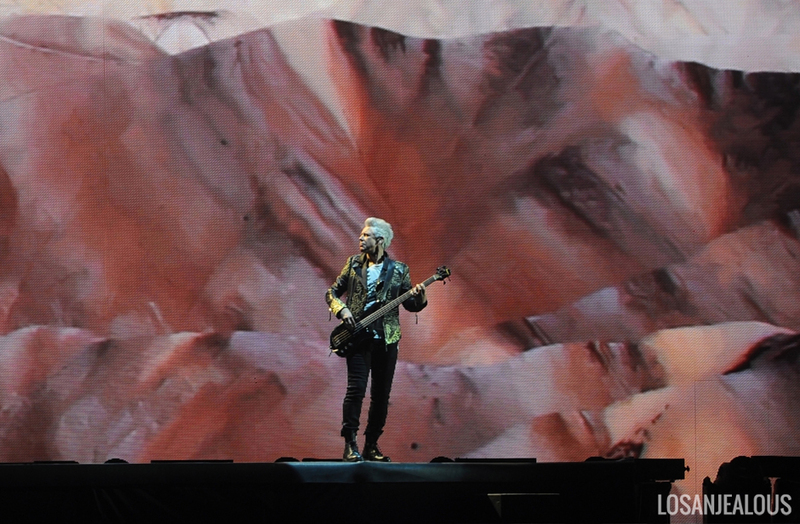 After a brief break after The Joshua Tree–just long enough for Adam Clayton to change bedazzled T-shirts–they return with a few more non Joshua Tree numbers. “Beautiful Day,” which has been willed into a later period classic by all the cultural usage it gets, is typically affirming if perhaps losing a bit of its punch from its ubiquitousness (Bono throws in a line from La La Land’s “City of Stars”; sure, why not.) “Elevation” gets an airing, with the Edge clearly digging playing it, cutting loose on its distorted chords. “Ultraviolet (Light My Way)” gets dusted off from the back end of Achtung Baby with an accompanying video streaming faces of female “luminous icons” as Bono calls them. It’s a long display of notable women over history from Aphra Behn to… Lena Dunham (our seat section shared a collective eye roll at her inclusion). “Miss Sarajevo” from the Passengers collaboration album gets a new video by the artist J.R., resetting the 1995 song originally about the Bosnian refugee crisis to with footage from a Jordan refugee camp in a moving touch. Into the final stretch of the set, they return to the pre-Joshua Tree days, leaving out the new song “The Little Things that Give You Away” they have performed other nights. “Bad” with it’s “Wide awake/I’m wide awake/I’m not sleeping” coda now, for better or worse, takes on a new resonance as “wokeness” has the current slang catch-all for displays of any amount of conscientiousness. They go out on a ripping take of “I Will Follow,” the first song of their first album (Boy, 1980) in a nice bit of symmetry to close the night. Admittedly, it’s a victory lap for a band that really does not need it, but it feels completely earned–both by the band and the fans. The timing is right for a record set during Reagan’s America to get a revisiting in Trump’s America, for better or worse. That said, 1991‘s Achtung Baby looms today as an even more prescient vision of today’s media saturated times and is as cohesive an album, front to back as Joshua Tree. 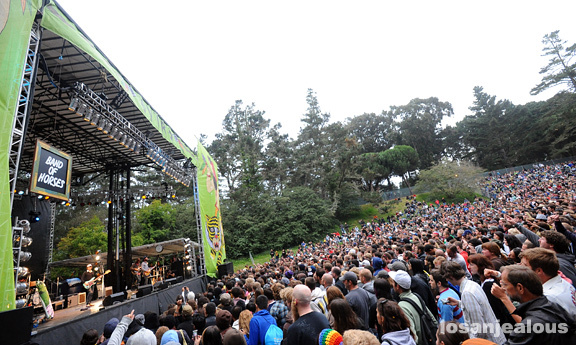 Here’s to looking forward to 2021 for that 30th anniversary tour, complete with a total Zoo TV stage recreation.